Alternative splicing and the transcription are the most familiar processes amongst the biological processes. Alternative splicing is a process by which various forms of mRNA are generated from the same gene. A gene consists of various exons and introns and the exons are joined together in different ways . This leads to the production of different kind of proteins from the same gene with different forms of mRNA which are known as “transcript variants”, or “splice variants” or “isoforms” (Fig.1) . 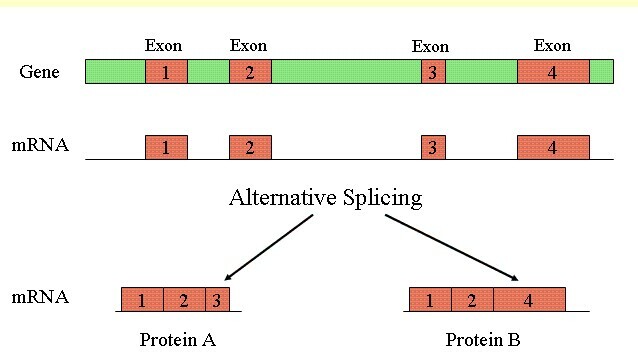 The proteins produced after the alternative splicing are affected in different ways. As these transcript variants encode for different proteins having different amino acid sequence and hence produce different functions . BLOCKS , TM-HMM  and InterPro  are the most commonly used databases for the protein annotation detection in human and mouse proteins [6,7]. With the help of web tools, conserved regions in the proteins encoded by different splice variants can be easily identified , but mapping these regions back on to the gene is very tedious and may cause various error . Addressing the above problems, Mall et al., (2016) has developed a new software known as “ProtAnnot” as a plug-in in the IGB (Integrated Genome Browser) . IGB is a user- friendly genome browser which helps the user to analyze the genomic data and the RNA-seq data . ProtAnnot provides a deep insight into how the transcription and alternative splicing affects the protein and its function . ProtAnnot provides a fast and efficient way to visualize the impact of alternative transcribed proteins and display linked blocks which represent transcript structures and the thickness of the block represents the translated region . it uses a color scheme to show the frame of translation. Exon colors between transcripts can help the user to easily determine whether they encode the same protein or not . it provides an exon summary which helps the user can easily identify different regions such as sequences that are included due to alternative splicing, promoters, or 3′-end processing [2,10]. displays protein annotations next to their corresponding transcripts which help the user to identify how different regions of a gene may encode different functions (Fig.2) , thereby linking the alternatively transcribed protein function to the respective gene. allows saving the search results for later use. Fig. 2 ProtAnnot visualization of Arabidopsis thaliana gene AT4G36690 encoding splicing regulator U2AF65 . Cline,M.S. et al. (2004) The effects of alternative splicing on transmembrane proteins in the mouse genome. Pac. Symp. Biocomput., 17–28. Loraine,A.E. et al. (2013) RNA-seq of Arabidopsis pollen uncovers novel transcription and alternative splicing. Plant Physiol., 162, 1092–1109. Rodriguez,J.M. et al. (2015) APPRIS WebServer and WebServices. Nucleic Acids Res., 43, W455–W459. Nicol,J.W. et al. (2009) The Integrated Genome Browser: free software for distribution and exploration of genome-scale datasets. Bioinformatics, 25,2730–2731. English,A.C. et al. (2010) Prevalence of alternative splicing choices in Arabidopsis thaliana. BMC Plant Biol., 10, 102.